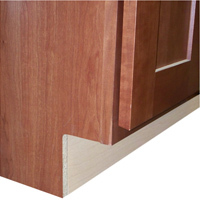 1/2" substrate with light maple wood grain interior matching laminate exterior. Can be upgraded to Plywood. 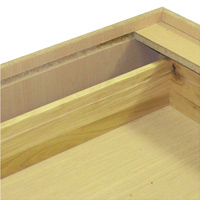 1/2" substrate with light maple wood grain interior and exterior. 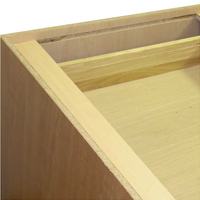 Can be upgraded to Plywood. 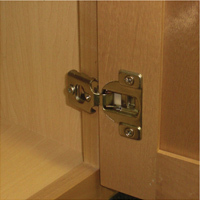 6-way adjustable, self closing concealed hinges. 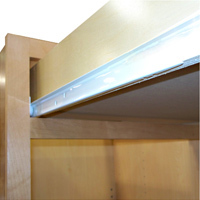 Full depth braces provide I-beam stability and convenient anchor points for counter tops. 1/2" woodgrain laminate rabbeted into ends, glued to top and bottom with industrial grade hot melt glue. 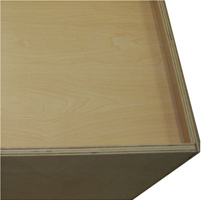 Can be upgraded to Plywood. 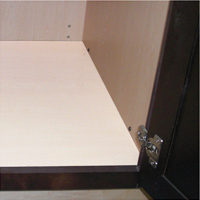 4-1/2" toe kicks with 3-1/2" inset on all standard base cabinets. 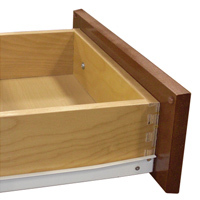 5/8" dovetail drawers, featuring four-sided construction and captive 1/4" matching laminate bottom. 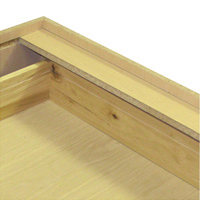 3/4" thick and 1-1/2" wide, kiln-dried hardwood assembled under pressure with screws. 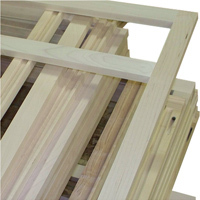 Offers maximum strength and squareness. 3/4" MDF with a powder coated finish with Teflon additive. 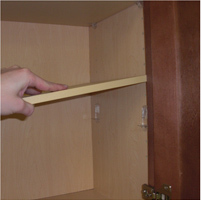 Attached with locking shelf clips. Features captive roller, epoxy-coated stay-closed side guides. Rated at 75 lbs. 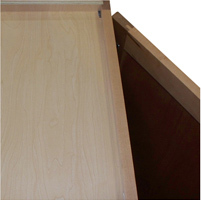 1/2” MDF with a water resistant powder coated finish on all Sink Base Cabinets.